Oh, my cider kegs and pumpkins! We've whooshed around to another Friday! And we've whooshed through another month! And we are whooshing rapidly towards another Christmas!! Somebody throw me a rope! I have a couple of cards for you today. Here is the first. I came across this one-layer card base as I was flipping through my scrap box yesterday. The colored background was made by applying markers onto an acrylic block, spritzing the block with water, and then pressing it onto a piece of glossy card stock. When I picked it up, Hammy saw it and squeaked that it would be a fun background for the black raven cutout, also in the scrap box. And so it was! The sediment is from SU. EZPZ. QACAS. LMNOP. Sorry. It's like a sickness. 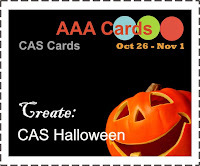 AAA Cards where the theme is Halloween. Fusion Card Challenge where I used the photo inspiration of fall or Halloween. Addicted to Stamps and More where the them is CAS (clean and simple). Simon Says Stamp Wednesday Challenge, where the theme is Anything Goes. 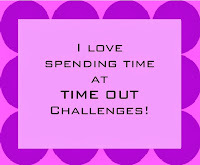 TIME OUT Challenges, where the theme is "Birds of a Feather Flock Together." Please click on any of the links for all the details on rules, prizes, and sponsors. My second card is in honor of October being Breast Cancer Awareness month. Honestly, I feel like every month should be dedicated to breast cancer awareness and fundraising, but since we can't have that, we'll take October and I'm squeaking in under the wire on the last day! I based my card on a card that was mailed to me with a request for funds. Unfortunately, I can't find it now to show it to you, but that was my inspiration. I'm not listing the source of all those sediments because it would be a very long list. Everything is not lined up perfectly, but that's okay; I'm just delighted that I managed to stamp them all without one of them being upside down!! I hope you have had a mammogram already this year or have one scheduled! That's a gift you give yourself and your loved ones. I am delighted to welcome five more of our newest friends to the Playhouse! I hope you will visit them and introduce yourselves! Hellerlittle from ~~~~~~H3. Hellerlittle is from Germany. She has been blogging since 2010. I just love her designs and the depth and dimension she is able to achieve with her beautiful works of card art. Cathy P. of My Creative Space. Cathy has been blogging since 2013. She is an award-winner and design team member. You can feel Cathy's joy for card making through her bright and cheerful cards! Caz (Carol) of Pouring My hART Out. Caz has been blogging since 2012. She doesn't post often, but she is worth the visit when she does! She's a happy girl who loves anything fun and cute and she loves knitting, too! Debi J. of Debi's Joy. Need I say more?! Debi has been blogging since 2010 and she is very passionate about this wonderful hobby of ours. When you visit, you will find tons of heartwarming and inspirational posts full of Debi's outstanding cards and layouts! Ruth of Patterned Paper and All Things Pretty. Ruth has been blogging since 2009! She is also the owner of Fairy Heaven Designs. She is an ambitious challenge player and her cards are always charming, well-made, and inspirational! Bwahaha! That's MISTER Pumpkin to you! I saw the idea on a TV show where you enlarge a photo of each family member's face, cut out the bits and tape them to the pumpkin. The human Mister only brought home one pumpkin from the grocery store, so I decorated it with a photo of his face while he was away at work. Does he scare you a bit? Or are you like me and karacking up over it?! As always, thank you for coming by to visit the Playhouse and special thanks to you if you take the time to leave a comment and /or join as a follower! Please let me know you came by, so I can be sure and return the flavor! Hullo Darnell, have popped over 'cos thought of you, as used some NBUS and blogged it y'see!! I love both the cards and the pumpkin idea is, well...hehehehe! Love your two card, Darnell and the pumpkin!!!! Have a happy Hallooween and a great weekend!!! Absolutely cracking up at the pumpkin. Hilarious! Love your cards. The inked background is amazing and the hope card...wow! Love how it all goes so perfectly. They're both fab cards Darnell, and you know...? I think an upside down sentiment or two may well have worked too! HA what a FUN pumpkin!!! I love the black crow against the pretty fall colors, marvelous card Darnell. And I agree with breast cancer awareness being everyday, wonderful card! Great use of your scraps Darnell, I never throw anything away! LOL. My new cupboards are stuffed and am having to aquire extra storage! 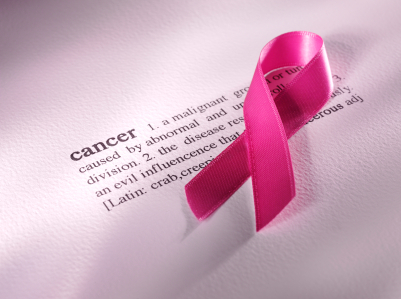 Mammo done for this year and a positive result in that it's a negative, if you get my meaning! You are quite right to hi light the importance. It's nearly 20years since that pesky lump appeared! Bwahahahahahaha...Mister Pumpkin is hilarious, especially the 'stache! Too funny! Both your cards are fabulous; the second for a more than worthwhile cause, and the first pure delight for Halloween! Cool background! And I get to say, ahem...Thank you for sharing this gem at ATSM! Hugs! Great cards there Honey. And as for Mr Pumpkin...I would have had a thump if I did that to mine! So funny. FAB makes, Hammy was soooo right about that background too!! Lovely way to use a whole bunch of sediments!!! Love Mr Pumpkin too! Your pumpkin is too funny! Love this idea! And that background works perfectly with the raven! Hammie did it again! Have a Happy Halloween (hope your pumpkin doesn't scare away the trick-or-treaters ;)) and a great weekend! Wowm, your card is just brilliant, I love, love the background it looks amazing. love the halloween card and your pumpkin - isn't it fun when scraps come together and make a great card!! HAHAHA! I bet the Mister just loved your pumpkin! That's too funny. I can't decide which of your cards I like better the crow is just so graphically cool! And the card full of words? I love EVERYTHING about it. 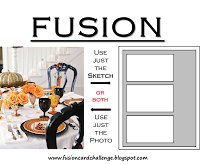 Maybe it's my fanatical quest to rid my cards of white space? I haven't seen anything like it and it's genius! Well, that's sure to scare the kids from your door ;). Love your raven card - that background is fabulous, and perfect for the silhouette. I love how you've made a sentiment wall on your breast cancer card too. LOVE the Pink HOPE filled card Darnell! MAMMOs are soo important for catching things in the early stages..both my MOM and MIL are survivors from early detection. Oooh, I recognised Mister straight away! He does make a handsome pumpkin head... Love that crow/raven - I so wish someone would do a die like that, he is brilliant! Your Cancer card is so clever and has so many positive messages on it, it is wonderful. Love both of your cards. If it's a bird, I love it (whether it's supposed to be sinister or not). I made my Breast Cancer Awareness card a Christmas card this year. Liked yours a whole bunch more. How does your Mister feel about his pumpkin avatar? Personally, it's the best Halloween decoration I've seen. Look at you Darnell - making such a wonderful card from pieces in your scrap box! love the crow with his great background! thanks for joining us in the Fusion Challenge! and that pumpkin is SO fun- what a great idea! Mr Pumpkin is AMAZING !!!!!!!!!!! I nearly fell off my crutches laughing. Darnell you have been missed !!!!! Love both cards Darnell, especially the Raven card. I am so glad that you kept that awesome background paper. Your watercolour is a perfect stage for the Raven! Your pumpkin for tonight is very clever! How does Mr. like it? Fabulous cards, Darnell! Love the background with your wonderful raven cutout! Pretty cool pumpkin too--hope you have a fun-filled Halloween!! they are both really great. The second it a very clever design, and show lighting a very worthy cause. Fab idea of your DH on the pumpkin. Must try that next year. Wonderful card designs. I really like the Halloween one. Great bright background, simple but still fun and that black bird cutout looks fantastic with the colorful look behind him! Happy Halloween too! Cute pumpkin idea as well! Both card are great and love the pumpkin!Happy Halloween! I saw that TV show, your pumpkin is great! Really like that raven card! Happy Halloween! Love the background behind your birdie. Must give it a bash. Would love t have seen hubbys face when he saw the pumpkin lol! Hi Darnell, fab post and I was scared stiff when I saw your pumpkin, not really, giggles a plenty. Good job you put a mini photo of your card at the bottom as the proper images still has not down loaded for me, but it looks stunning and a very different image for Halloween, crows are always about on spooky pictures but very rarely in the spotlight. Darnell, I LOVE, LOVE the Halloween card. I think those backgrounds look fabulous with a silhouette stamp in the foreground and your crow is so perfect for Halloween! Love all the messages on your encouragement card, too. Now just you make sure you brush your teeth after all those sweets! Hugs MrsA. Hammy was right. The raven is perfect on this wonderful background! Love the Mister Pumpkin. What a great idea! Your cards are awesome as always, and I just love that background for the raven! Your pumpkin made me giggle! Hammy had the right idea. That smooshy background is perfect for the raven. Love all the sentiments on the bc card and am intrigued by Mister Pumpkin. Yes, the pumpkin cracked me up...will have to remember that for future pumpkin carvings!! Great card...perfect timing for the black raven!! Happy Halloween, Darnell! Fantabulous cards, Darnell. And I just love how you decorated your pumpkin. It's perfect. Hey Darnell! The pumpkin is my favorite - it may actually be my favorite pumpkin I have seen this year. Fun idea. The cards are wonderful too - love the spritzed bg and all the affirming sentiments. The main sentiment or sediment is soooo true. My Mom is on her second bout with breast cancer. Five years after a mastectomy and radiation, hers came back. It grew fast and had spread to her bones by the time they found it. Tumors were splitting her shoulder bones apart already. Stage 4 diagnosis with no smiles or "maybe things will get better and you will live until your Granddaughter's wedding in a few months" - just serious faces and we will try some things to slow it down and make things easier at the end. That was almost two years ago and at her visit yesterday they said that there had been no new tumor growth since the original diagnosis and some of the spots were shrinking in the bones. So you do never know! Thanks for your sweet and very fun posts - I always love to visit. Darnell...your first card is perfect for our TIME OUT Challenge-birds of a feather flock together-get on over there and enter (pretty please!). Love the background colours! And that collage card is fabulous and what can I say about Mr Pumpkin....spooky! Oh Darnell - it's always a pleasure to visit your blog! Love, love the raven card - perfectly CAS and perfectly Halloween - thanks for playing along with ASM this week. I think your Mister Pumpkin is brilliant! Wow! Love, love, love this card. So CAS and yet so detailed. Ever so glad you joined in with AAA this week! Darnell, you have a wonderfully unique and attractive design style! The bg is sensational! Thank you for adding your creation to the AAA Card gallery! hahaha!! That's a great idea for a pumpkin ... wish I'd thought of it ... Great cards Darnell ... Have a fun weekend! Darnell I like both cards. The crow could be altered with another bird and be used for other occasions. (Bet you didn't think of that - ha ha). Your pink card is on my Pinterest board - amazing. Your cards are beautiful, as always. haha! That pumpkin is too funny! Two great cards in this post! "Throw me a rope"! I love it! I need one too! So sweet of you to pop in to see me. That meant so much. Thank you. I needed to get back to what I love doing...or what's the point? Love, love, love your crow card! Cool cards, Darnell! I love the bg in your bird-card, the die cut bird really "jumps" form it. Hilarious pumpkin too! :) Thanks for taking TIME OUT and joining us! Love the black against the background! Thanks for joining in at AAA and on your WIN! Gosh, I really, really missed you Darnell! Your Halloween card is fabulous...Beautiful background and the silhouette of the Raven is stunning! I'm so glad you played along with us again at ATSM! We always enjoy seeing your creations! LOVE your breast cancer awareness card, too! Sure wish we could find a cure already!!! I've never tried the acrylic bloc background technique before. I love how it turned out, it looks awesome! Always a joy to visit you Dolly! :) LOVE the cards ... the acrylic block background is gorgeous ... and perfect for a black silhouette. And congrats on the Breast Awareness card ... that's a lot of stamping, lining up, etc. etc. Bold, beautiful and perfect. Ooooh...Mister on a pumpkin....that's scary!!! Your scrap box treated you well! I love acrylic block backgrounds and this one is especially nice with the texture and colors. It is a perfect backdrop for the simple raven!! Somehow October got away from me - I usually do a number of breast cancer awareness cards because they sell well at church - I think I only got one made this year. I probably need to rethink my priorities given very few Halloween cards sold at church. I was cracking up over "Mr" Pumpkin!! WOW!!... still loving hearinf of the Lake Prior Escapades! FUN, FUN, FUN!!! Love your crow/blackbird for FUSION!!! Thanks for joining us!!! Oh what a kick--did Mr like the pumpkin? Mine is just plain, but one cute little guy said he liked our pumpkin. You never know what kids will say. I love that background & it IS perfect with the raven! Such a great Halloweencard! love that colourful background for that spooky-big raven! (A fun technique) And so good of you to make a card for that day aswell! Thank you for taking the TIME OUT and join us! So simple. But what an affect!! Perfect for the raven! First of all... I LOVE the Mister Pumpkin! This is hilarious and something that I am definitely going to do next h'ween! Great cards! The inked background is amazing! Perfect h'ween colors, especially for a crow! Your breast cancer awareness card says it all. The randomness and unpredictability of the sentiments seem to mimic the same characteristics of this nasty infliction. Oh dear... I tried to delete my comment but can't! The last line sounds so negative! Don't mean it to be and should likely have edited it before I hit send! I really was trying to find the right words to say that your card will definitely encourage and support the recipient! What did 'Mr Pumpkin' think of this likeness?? Brilliant idea, can just imagine a whole family of pumpkins lined up on a deck, hilarious!! Fantastic card and just love that schmooshed background with the black silhouette, very stylish indeed. Love to see you at TIME OUT and really hope you come back again soon! Wonderful card! The background you created is amazing... going to case that my dear.. and oh my! Mr Pumpkin just stole the show! I love it! Stone the crows - LOVE your FUSION card Darnell!! LOVE your background on your raven card and love that he's perfectly perched! I agree, it should be year round for breast cancer awareness....love your design! ....such a fun mr. pumpkin! Tee hee hee. Bet you got lots of comments on your Mister-o-lantern from trick-or-treaters. I love your raven. Hammy done good.